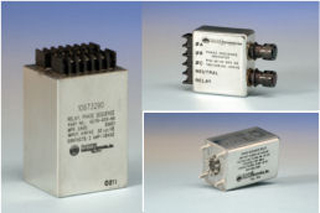 Phase Sensors and Phase Sequence Relays from DARE Electronics, Inc. Protect aircraft equipment & other devices from damage due to phase loss or reversal with DARE’s phase sensors & monitors. Designed to monitor the phase sequence of three phase power, DARE’s phase sensors will protect electrical equipment that is sensitive to incorrect phase sequence (rotation), phase loss, or phase reversal. When the phase rotation is correct, the output of DARE’s phase sensor will energize. When the phase sensor detects an out-of-phase condition, the output will de-energize. The contacts of the phase sensor can be used to disconnect a load, operate an alarm circuit, or both. In addition, phase sensors can be used in conjunction with a power contactor that will perform the actual switching of the load and can be designed to monitor for over and / or under voltage and over and / or under frequency conditions. DARE’s phase sensors and monitors are highly customizable and available in a wide variety of standard and custom enclosures. Relay outputs from SPST to 4PDT are available with ratings from dry circuit to 25 amps resistive. Mounting configurations, finishes, and connectors can be custom tailored to meet your requirements and indicating lamps are available if desired. Consult our phase sensor product datasheet or a sales engineer for more information.